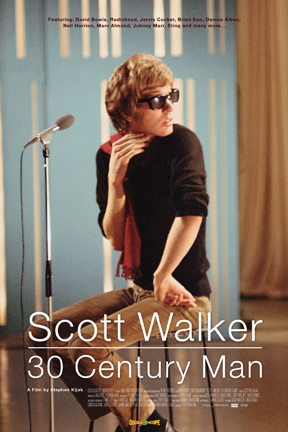 SCOTT WALKER » Blog Archive » North American DVD: Out Now! Oscilloscope Laboratories, the fine distribution company founded by Adam Yauch of the Beastie Boys, has a street date of June 16th for the North American SW30 DVD. Long, long, LONG overdue in the US of A, the DVD will feature some exclusive DVD extras including a bit more making-of-The Drift studio footage and an extended tour through the incredible collection of Walker-collector par excellence, Arnie Potts. More info on how to pre-order (and purchase the nice new poster) here. LA gets one more chance (yes LA, this is your third opportunity) to catch it on the big screen on July 1 &2 at the New Beverly. And word has it that the film will open the Last Call Film Festival in Louisville, KY on June 27. This entry was posted on Monday, June 1st, 2009 at 3:57 pm	and is filed under News, screenings, Reviews. You can follow any responses to this entry through the RSS 2.0 feed. Responses are currently closed, but you can trackback from your own site.